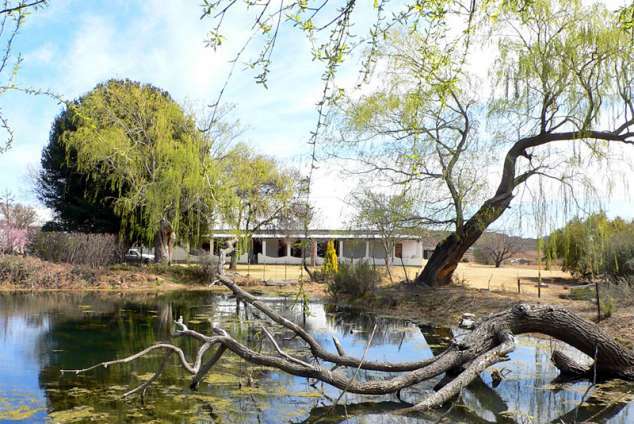 Stillewaters Self Catering is a lovely, big main 1880 farmhouse on the working farm Stillewaters which is situated only 5 km from Richmond and the N1 out on the Graaff-Reinet road (R388). This three bedroom holiday home is the perfect stopover or getaway for weekends with families, friends, bird watchers, nature lovers, fans of country living, landscape photographers, writers or anyone seeking peace and quiet. This spacious house can be booked for one group upon request, alternatively the rooms are booked separately. It can comfortably sleep 10 people in three bedrooms. All three bedrooms have access to the communal kitchen which is fully equipped. There is also a communal dining area with an indoor braai and a communal sitting area with a fire place (wood is sold at the Caltex garage in Richmond). There is one separate outside braai area. There is also an enclosed courtyard adjacent to the kitchen ideal for pets. Although from 1880, everything is in working order, clean and neat. Meals are available when requested in advance. The house is comfortably furnished, beds are made and towels are provided. Room 1 - En-suite room: 1 Double bed and 1 single bed with an en-suite bathroom (bath and shower). Room 2 - Garden room: 1 Double and 1 single bed. This room shares a separate bathroom with the Sunroom. The bathroom has a shower and bath. Room 3 - 1 Sunroom: 1 Double bed and 2 single beds with a sitting area. This room shares a separate bathroom with the Garden room. The bathroom has a shower and bath. There is also a separate flatlet accommodating 4 people that has one bedroom with a double bed and a sitting area and one bedroom with either 2 single beds or a bunk bed. This unit has a kitchenette and separate bathroom with a shower. The Hunting Lodge is separate from the main farmhouse and accommodates 6 people. It is a spacious, self-catering unit with a breakfast bar, living area, private bathroom and fireplace. There is a large room with a double bed and 4 single beds. The kitchen has a fridge, stove and oven. Guests are free to roam around the yard and the nearby grazing lands, river and dams. 4 x 4 Tracks, horse-riding and horse or donkey cart rides are available upon request. All pets are welcome by prior arrangement. There is a big, grassy courtyard - enclosed with high walls - adjacent to the kitchen. Dogs must be on a leash when taken out of the yard. Trained pets are welcome to sleep inside on their own beds. Come and enjoy the amazing views, breathtaking sunsets, star filled nights and Karoo hospitality with excellent value for money, endless space for children to unwind and all in safe surroundings. 2812 page views since 14 Aug, 2015.